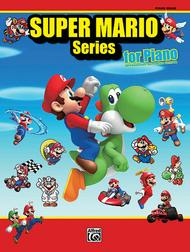 34 Super Mario Themes Arranged for Solo Piano. Composed by Koji Kondo, Shiho Fujii, Asuka Ohta, Soyo Oka, Kenta Nagata, Hirokazu Tanaka, and Mahito Yokota. This edition: Piano Solos (Intermediate / Advanced). NAMM Best in Show; Piano Collection; Piano Supplemental. Video Game. Book. 80 pages. Alfred Music #00-38600. Published by Alfred Music (AP.38600). After decades of anticipation, Alfred is proud to release the officially licensed, collectible sheet music companion folios to the Super Mario Bros. video game series. The 34 arrangements in this intermediate-advanced piano edition are note-for-note transcriptions of instantly recognizable melodies beloved by generations of gamers around the globe. From Koji Kondo's iconic "Super Mario Bros. 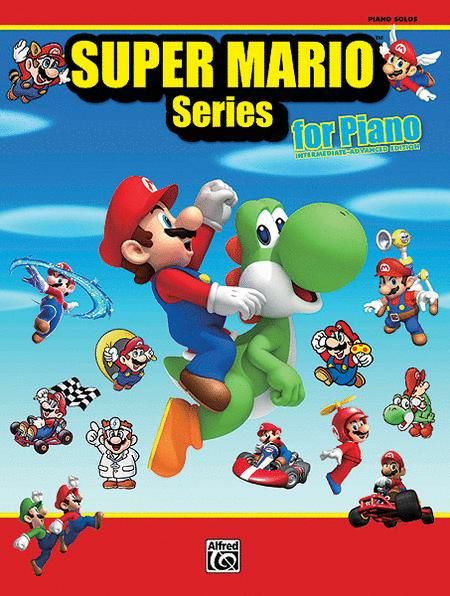 Ground Background Music" to the New Super Mario Bros. Wii themes, the dozens of pieces in this book represent two and a half decades of Nintendo video game favorites. Adding to the fun, graphics from the corresponding games grace each page of the sheet music. Impress friends, family, and audiences of all ages by playing from this magnificent collection, which makes a great gift for every pianist. Titles: Super Mario Bros. Ground Background Music * Super Mario Bros. Underground Background Music * Super Mario Bros. Underwater Background Music * Super Mario Bros. Castle Background Music * Super Mario Bros. Invincible Background Music * Super Mario Bros.: The Lost Levels Ending * Super Mario Bros. 3 Map 1 * Super Mario Bros. 3 Ground Background Music * Super Mario Bros. 3 Boss of the Fortress * Super Mario Bros. 3 Skyship Background Music * Super Mario World Title * Super Mario World Castle Background Music * Dr. Mario Chill * Dr. Mario Title Background Music * Super Mario Kart Mario Circuit * Super Mario World 2 Yoshi's Island Athletic * Super Mario World 2 Yoshi's Island Ground Background Music * Super Mario 64 Main Theme * Super Mario 64 Water Land * Mario Kart 64 Circuit * Super Mario Sunshine Dolpic Town * New Super Mario Bros. Title * New Super Mario Bros. Giant Background Music * New Super Mario Bros. Battle Background Music 2 * New Super Mario Bros. Battle Background Music 1 * Super Mario Galaxy Ending Staff Credit Roll * Mario Kart Wii Rainbow Road * New Super Mario Bros. Wii Ground Background Music * New Super Mario Bros. Wii. I love this book. It has all of my favorite Mario Bros songs. February 16, 2012 Great Book! Missing important pieces! comes to mind is that Athletic Theme from Super Mario World. But this song is NOT IN THIS BOOK?! That song you hear on the SNES, with that "Honky-Tonk" piano, didn't make this book? What about the Super Mario Bros. 2 Overworld, the SMB 3 Athletic, and Super Mario 64 Bowser Battle? There's so many songs you can't get them all in one book. Fun, accurate, sometimes difficult. Reminds me of music for silent films. Some of the pieces are modern too. Great variety.